Lei plus size jeans are the ideal addition to a full-figured woman's wardrobe. They also make their line in junior sizes so that young women who develop early can feel good about their clothing and their body. The entire company has a mission that's focused heavily on self-empowerment and individuality. 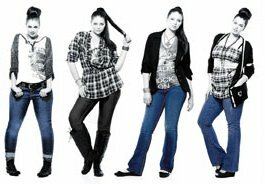 They believe that there is no one pair of jeans suited to every women, every body type, every lifestyle - and they are determined to reflect that ideology in their clothing line. You can understand this philosophy better by taking a closer look at this company's name: LEI. These three letters are an acronym for Life, Energy, Intelligence, three things they strive to offer particularly teen girls who may feel awkward in their bodies. The line launched in 1991 and sells to various retail outlets like Wal-Mart. While you might think that a name like L.E.I would be completely out of your budget, you're in for a pleasant surprise. These plus size jeans have style and flare, but at a price that won't make you faint on the spot. The junior line in particular strives to offer the best of up-and-coming style at a price that teens and parents can live with peacefully. The company also offers a line of accessories like sunglasses and handbags, shirts, and even shoes with the full-bodied girl in mind. They've been so successful at this that in 2002 its estimated that L.E.I. had about half the market share for teen jean sales. And for adult women? Don't despair. L.e.i. takes their ideas for the youth market, give them a little more maturity, but keep that lively feel in the designs. You'll never want for a good cut or fashion sense in lei plus size jeans. These pants redefine chic for today's busy world. Let's give you a peek at two very popular L.e.i. plus size products. First is the low rise flared jean. This captures the trendy style of a flare pant using a washed denim fabric. If you like pockets, you get one embroidered back pocket that dresses up the whole look. Alternatively, L.e.i. plus size jeans have a loop stitch pocket. The loop refers to the loop stitch decoration on the back pocket of this creation. The fabric is a little crinkled, giving them a lived-in look that's playful no matter what you're doing. No matter what L.e.i. style you choose, you're sure to get a quality pair of jeans that you'll love to live in for many years to come.